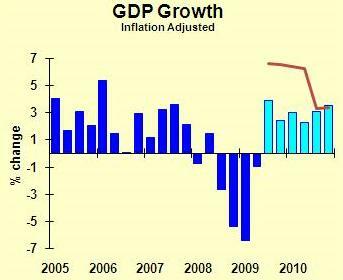 That red line is the average growth rate in recovery, assuming that second quarter was the bottom for GDP. The biggest risk to my economic forecast: I’m too pessimistic. I hear from lots of people who think I’m too optimistic. However, I look at how much lower my growth forecast is compared to the average of past recoveries, and I think that if I’m wrong, I’m not optimistic enough. I predict that consumers will show some life, especially in durable goods and clothing. The cash for clunkers program will not have much stimulative effect by itself, but it demonstrates that consumers are ready to come off the sidelines and do some spending. I’m very cautious about business spending. I think non-residential construction will continue to shrink, and spending on equipment and software falls through the first quarter of next year. These sectors tend to be lagging indicators in a normal recovery, and financing constraints will also limit growth. Inventories will continue to shrink through year-end, but this is where I could easily be wrong. Inventory changes are big and wild, and I’m being cautious. If we get a barnburner quarter in this recovery, it will be due to a big gain in inventories. Residential construction has one big strength: it can’t go much lower. No good news in that area in my forecast. Exports will decline just a little more, though imports fall at a larger pace, helping our trade balance. We’re seeing good news from Asia and parts of Europe, so the rest of the world is probably going to turn up before we do. Government spending continues to grow in the federal side, with modest gains in defense combining with larger gains in non-defense. State and local government spending shrinks through the end of the year. Do you play a role in your company’s annual planning process? If so, I’d like to hear what economic assumptions you are making in your plans.